Hair Cutting and Prek Letter A WrapUp! So on to boxes! 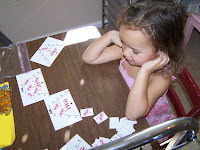 I decided to do review on Fridays for all the letter stuff she learned all week. I let her pick her favorite Letter A games and fill her own boxes, she loved this idea! She chose the Aa matching ant game, you can download it here. She also chose the anthill counting game, the goal being to put the correct amount of ants on the hill based on what the card says. You can download this one here! Next up was the Apple Aa matching game and apple counting, I downloaded both from here. Her Aa lacing cards, you can download a copy here. 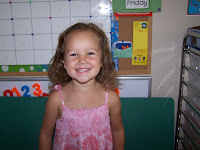 And finally some Itty Bitty Tot School pics…still working on furniture walking, climbing 101…oh and eating the numbers off our workboxes, that also ranks as her number 1 fun thing! I have a member of that club, too. She was even smart enough to say that her brother did it! That's a good idea to do a review day. Yeah, me too, hopefully I can hide it for the wedding! LOL! My other daughter cut her bangs clear up to her scalp almost b/c she didn't want them anymore, after I explained that she had to grow them out, not cut them off she goes 'oh' and grew them out. Funny kids and they're ideas!